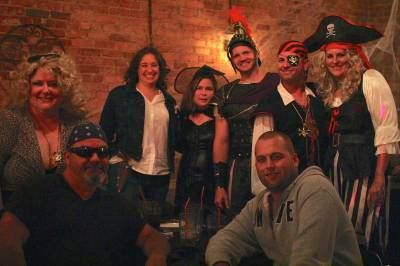 Pirates and zombies descended on Clayton, NC… and no, not for trick or treat. 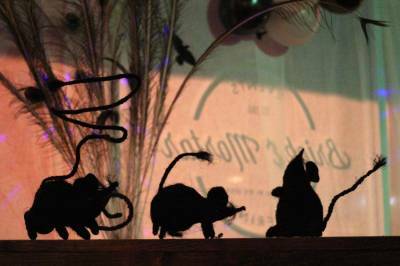 These characters gathered for dinner and dancing at Brick & Mortar, the newest events venue in town which features rustic brick walls and 30’ ceilings in a wide open space with bar, dining area and dance floor. Cozy nooks are built in, too, allowing for more intimate conversation. It’s a great addition to Johnston County’s ever expanding entertainment options. My husband and I donned our pirate gear and headed out for the fun. We enjoyed an incredible buffet dinner, dancing and drinks. We both highly recommend this as a group night on the town! The location was once home to Mulberry on Main, one of the town’s premier independent restaurants. The owners, Jerry and Bernadette, enjoyed serving their customers through the years, but they recently closed the restaurant to focus on the catering side of the business. After a major remodel, Brick & Mortar Events began hosting weddings, corporate meetings and other special events. Desiring to remain connected to the community as a whole, they also offer public events for adults. The Clayton community can continue to enjoy the superior hospitality and great cuisine they’ve come to love from Mulberry on Main, in a new and memorable way. Jerry was inspired to cook from a young age by helping his mom in the kitchen, preparing meals for their large, close-knit family. It’s no surprise that his career took him into restaurant kitchens from a young age. He learned from every chef he worked under, whether the pizzeria or the 4-star Italian restaurant. After he and Bernadette married, they opened their first restaurant in New Jersey in 1986. Their success is due, in part, to their family’s commitment to helping them. At that first restaurant, Jerry’s younger sisters would work weekends alongside Jerry and his parents. They were only 12 and 13 at the time, but they worked hard, earned their money and saved enough to buy their own cars at age 16. That’s a solid work ethic! When Jerry and Bernadette moved their family to North Carolina, his extended family followed to support their dream. His mom still works Fridays, making her famous lasagna for the catering business. At Brick & Mortar, Jerry continues to run the kitchen. Bernadette and a couple of their adult daughters work front of house. Other family members work the bar and behind the scenes. This family’s commitment to a dream -- and to Clayton -- is evident in everything they do. 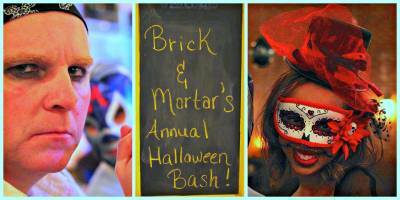 Brick & Mortar’s next event is coming up on New Year’s Eve, where you can welcome the new year with dining and dancing. 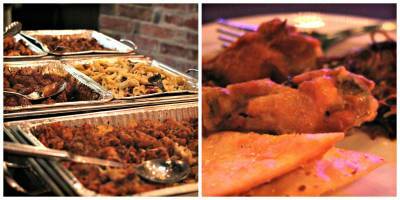 Leave the cooking and planning to Brick & Mortar and invite your friends to join you! Ticket information will be available later this week at their website. Advanced reservations are encouraged, though limited tickets may be available at the door. Evening events are geared for adults. Parking is plentiful, whether in the side lot next to the building, on the street or in the main parking area at the corner of Main and Lombard streets. Certainly, the addition of Brick & Mortar to Clayton gives Johnston County residents (and our friends from the Raleigh area) a great opportunity to enjoy a night out on the town, without having to drive into the big city.